Cynegils was the son of King Ceol of Wessex. He inherited the throne of Wessex from his uncle, Ceolwulf, in AD 611. 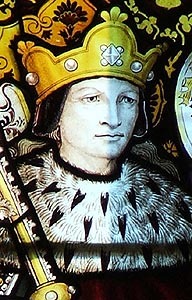 For much of his reign, he seems to have shared power with his eldest son, Cwichelm, who may have been given control of Upper Wessex (Northern Hampshire, Wiltshire & Berkshire). Their early reign brought glory to the kingdom through the defeat of the Dumnonian armies of the West (possibly under a King Clemen) at the Battle of Bindon in AD 614. In the 620s, however, the pair became increasingly worried about the rise of Northumbria and appear to have formed some sort of alliance with King Penda of Mercia. It was sealed by the marriage of Cynegils' son, Cenwalh, to Penda's sister. Then in AD 626, the hot-headed Cwichelm sent an assassin north to murder the mighty King Edwin of Northumbria. The attempt failed and, when Edwin, discovered the perpetrators, he marched south with a mighty army to teach them a lesson. The armies of Wessex and Northumbria clashed at the Battles of Win & Lose Hill in Derbyshire and, though the southerners were greater in number, they were outmanoeuvred and thoroughly defeated. The demoralized remnants of the Wessex army retreated back to within their own borders. Two year later, the Mercians turned on the weakened Wessex kingdom by making a move on the territories of Gloucester, Cirencester and Bath, which Ceawlin and Cuthwin had, at least nominally, seized from the Celts as early as AD 577. Wessex was again defeated, at the Battle of Cirencester, and it may have been at this time that the western section of the Wansdyke was constructed to keep the enemy from expanding further. Cynegils' kingdom did not emerge from obscurity until AD 634. In this year, the King received the Italian missionary, Birinus, at his northern palace at Cholsey in Berkshire. Birinus preached to the Royal court from a nearby hillock nearby, known as 'Churn Knob,' but Cynegils was not immediately convinced of the truth of Christianity. The following year, however, the regime in Northumbria changed and the new ruler, King Oswald, wished to restore relations with Wessex. He travelled south and, at Easthampstead, persuaded Cynegils to accept Christianity and to give Birinus the old Roman town of Dorchester-on-Thames within which to build himself a cathedral. In return, Cynegils' daughter, Cyneburga, was taken in marriage by Oswald, after which most of the Royal family were baptised in the Thames, between Brightwell and Dorchester. Cynegils probably lived to quite an age. He died in AD 643 but, Cwichelm having predeceased him, he was succeeded by his younger son, Cenwalh.